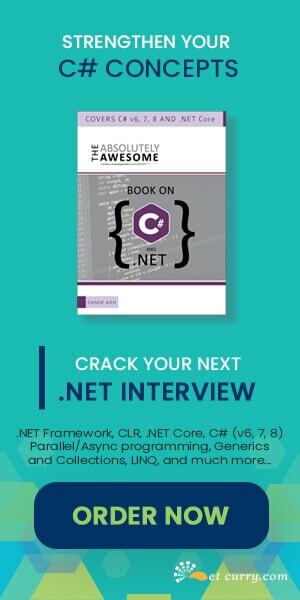 Abstract: In this article, we will explore how to implement paging in an ASP.NET GridView using an ASP.NET AJAX Slider Extender. As given in the ASP.NET AJAX Toolkit documentation “The Slider extender allows to upgrade an asp:TextBox to a graphical slider that allows the user to choose a numeric value from a finite range.” In this article, we will explore how to implement paging in an ASP.NET GridView using an ASP.NET AJAX SliderExtender. Note: I am using Visual Studio 2008 and thereby utilizing the ASP.NET AJAX plumbing that comes along with it. Step 1: Open VS 2008. Click File > New > Website. 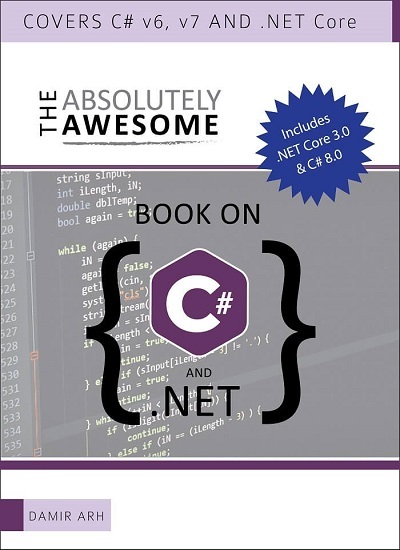 Choose ASP.NET Website from the list of installed template, choose target platform as .NET Framework 3.5, choose the desired language and enter the location where you would like to store the website on your FileSystem. I have created a folder called VS2008 Projects, so the location over here is C:\VS2008 Projects\ GridViewPaginUsingSliderExtender. After typing the location, click OK. Step 2: Open Default.aspx. Switch to the Design mode of Default.aspx. Open the toolbox (Ctrl+Alt+X) > Data Tab > Drag and drop a SqlDataSource control on to the form. Click on the smart tag or right click SqlDataSource > Show Smart Tag > ‘Configure Data Source’ wizard. Click on ‘New Connection’ to open the ‘Add Connection’. Type your ‘Server Name’ and ‘Select a database Name’ to connect to. Over here, I have used (local) as the ‘ServerName’ and the database I am connecting to, is Northwind. Click on ‘Test Connection’ to make sure that there are no errors while connecting to the server. Click Ok. Step 3: In the ‘Configure Data Source’, click ‘Next’. An option will be displayed to save the connection string to the configuration file. Select the checkbox ‘Yes, save this connection as:’, type a name for the connectionstring ‘NorthwindConnectionString’ and click Next. 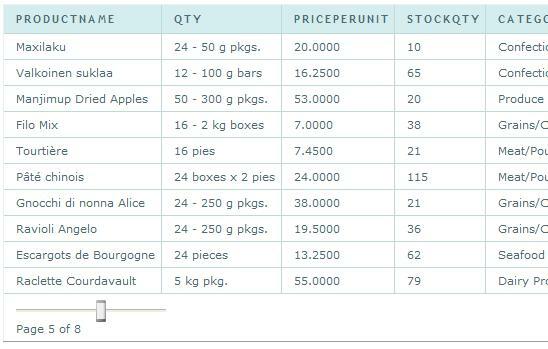 Step 4: In the ‘Configure Select Statement’ > select ‘Specify Columns from Tables or Views’ radiobutton > Select ‘Alphabetical list of products’ View in the Name and choose ProductID, ProductName, QuantityPerUnit, UnitPrice, UnitsInStock and CategoryName. Click Next > ‘Test Query’ to preview data > click Finish. The wizard adds a SqlDataSource control to the page as shown below. The SliderExtender uses its ‘TargetControlID’ ‘txtSlide’ to store its position state. We will add code to the ‘txtSlide_Changed’ event handler in just a moment. Step 7: The last step is to set the SliderExtender properties in the ‘GridView_DataBound’ event and set the GridView PageIndex programmatically in the ‘txtSlide_Changed’ event. In the txtSlide_Changed event, the code first uses the ‘Find()’ method of the GridViewRow cells to find the txtSlide control. The ‘PageIndex’ of the GridView is then set to the value of the txtSlide. The GridView_DataBound sets various properties on the SliderExtender. The slide.Maximum is the maximum value for the slider extender control position; in our case is the GridView.PageCount. The slide.Minimum is the minimum value for the slider control position. The Steps property represents the number of discrete values in the Slider. Note 2: If you are wondering why the paging occurs only on MouseUp, then this is due to the ‘RaiseChangeOnlyOnMouseUp’ property of the SliderExtender. It’s a good practice to set the value of this property to true to avoid async postbacks to occur each time the slider value changes. If you plan to implement paging using a SliderExtender in a ListView instead of a GridView, check out Matt Berseth’s article Data Navigation with the ListView, DataPager and SliderExtender Controls. I hope this article was useful and I thank you for viewing it. The source code of the article can be downloaded from here. the code is empty how can i get it ? shady83: Apologies. The link has been fixed. Hi. Its very nice aritcal. and i liked it. and i used in my application . thank you very much . Hi. When I try to config the pager position on Top, the slider won't work. Clicking on the slider cause the IE to scroll down the page. In Firefox it's working fine. Any sugestions? it's good article but how can i download code for this. i have been registered also. plz help me out in this. The code can be downloaded using the link given in the article- See last para. If you are a registered user or Newsletter Subscribe, the password has been emailed to you. It is showing error in SliderExtender in css file. it is comming with red underline. I think it need the namespace file. Thanks for the tutorial but it's not working for me. I am not able to get the paging in the gridview, I am binding my gridview from code behind instead of sql data source. Thanks, for this tutorial. It is working. This is a good job.